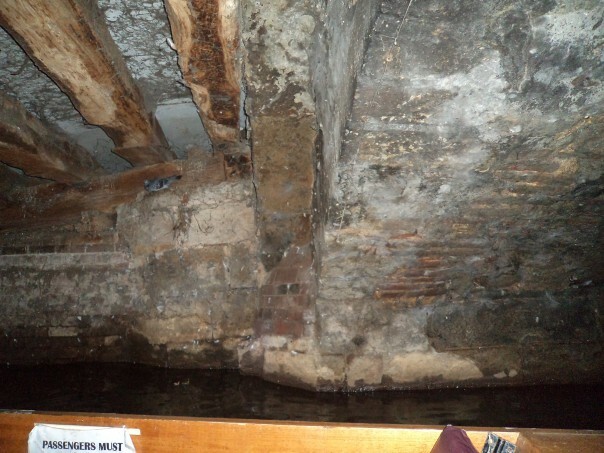 This week I had my first Canterbury boat trip when I went with Jonathan Carey (Eastbridge Hospital), Rupert Austin (Canterbury Archaeological Trust) and Rosie Cummings (Canterbury City Council) to look at the above waterline archaeology of St Thomas’ hospital at Eastbridge. It was fascinating listening to these experts discuss the type and state of the timbers and stonework of the hospital on the bridge, both in terms of the date of these various features, how the building had developed chronologically, the level of preservation, and what and how these features can be recorded. These factors are exceedingly important as part of the conservation and renovation that is presently taking place at the hospital, as became even more apparent when we came back onto dry land and went into the building itself. As Rupert pointed out, there is still some late medieval timber-framing extant in the west end wall, and, as well as the timbers, even some of the wattle and daub survives. Exactly what happened to this medieval hall in the 16th and 17th centuries is still being investigated, but it is likely that the area was subdivided to provide more privacy for the poor old men accommodated at the late 16th century refoundation by Archbishop Whitgift. Whether this subdivision was on the lines undertaken at the Great Hospital in Norwich is a moot question, but feasible, and interestingly at Norwich these cubicles are still preserved, albeit they have not been lived in for many decades. Indeed, the accommodation provided for the people at the Great Hospital today is excellent, there having been a considerable amount of rebuilding and new buildings in the last few decades. As I am sure many of you know, St Thomas’ started life in the late 12th century as a hospital for poor pilgrims. However exactly what the living arrangements were for the master and his staff, matters such as the location of the kitchen, and where the corrodians (long-term, fee-paying inmates) were housed are all questions that really need further investigation. One of the problems regarding such research is the limited survival of the medieval records. The hospital has a fantastic collection of deeds, which provide many details regarding its property holdings, but there are hardly any documents such as accounts or rentals. These are really what you need in order to investigate the life of the hospital, because, even though the revised rules are useful, they really only tell you what the patron wanted to happen, not necessarily what did happen. Wills, too, only give us tantalizing glimpses, like that of Henry Newell (1475), who bequeathed a mattress, a red-and-white coverlet and a pair of sheets to Alice the custodian of the paupers, who, according to the regulations, should have been elderly, that is over 40 years of age. Another aspect of this week was the first lunch time seminar organised by History for staff and postgraduates – really a research forum. Although it did not feature anything directly about Canterbury or Kent, Professor Robert Bubczyk’s topic: ‘Attitudes of the Polish Clergy towards Alcoholic Beverages’ would have been of interest to the monks and canons living in medieval Canterbury. For although they would have been perfectly knowledgeable about wine, unlike their Polish counterparts, until probably the 15th century they would have drunk ale not beer. Indeed the arrival of hops transformed agricultural practices in Kent in the late 16th century because the hop garden became the new commercial crop that (excuse the pun) sprung up all over the place. It looks like initially in the early 15th century hops were brought over to Kent from the continental mainland by entrepreneurs who saw a commercial opportunity, and one of the earliest records of beer brewing comes from the court rolls of Appledore. Although it is not documented, the fact that Appledore was a Christ Church manor may have meant such activities came to the attention of those in charge of the priory’s brewhouse, and beer may thus have been available at Christ Church before St Augustine’s. But to return to Professor Bubczyk’s topic, one area where senior churchmen in both Poland and Kent would have been in agreement was the concern over drinking alcohol to excess. Whether this was reported in terms of the behaviour of priests in chronicles or as examples in sermons, clerics and also the laity who visited taverns, especially at night, and who became drunk were castigated, such behaviour linked to greed and weakness. Interestingly in Poland it was also seen as creating frankness, so plying your guests might make them tell you what they really thought, but this did require the host to stay sober to get the most out of the situation. It is feasible this ‘advantage’ was similarly appreciated in England. Nevertheless, in English morality plays the watchword seems to have been ‘measure is treasure’, if Mankind is typical of the genre. For the dangers of visiting the pub are clearly displayed in the second half of the play when Mankind, having thrown away his spade and beads (rosary), joins the vices in the pub for further debauchery before being finally saved by Mercy from the ultimate sin of hanging himself. If you ever have the chance to see this late medieval play do take it, it is a real gem. And next week I’ll be reporting on further violent episodes in history after Dr John Bulaitis’ lecture on ‘The Battle of the Ducks’.